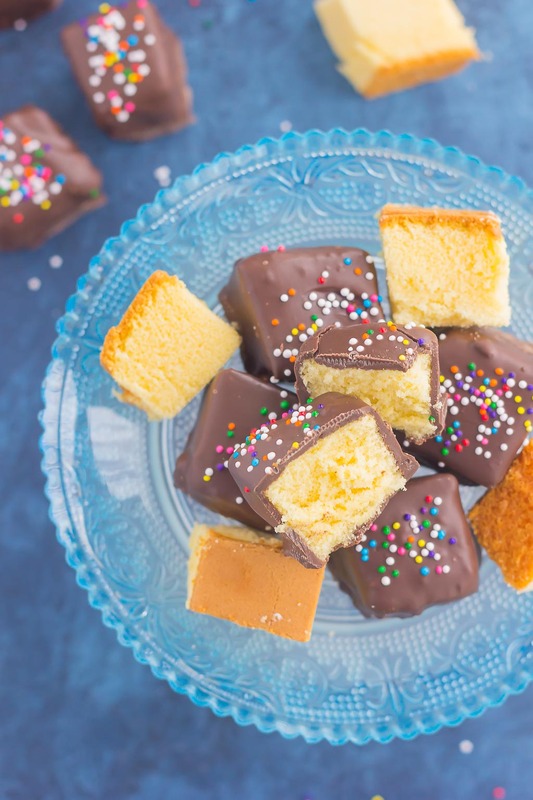 These Chocolate Covered Pound Cake Bites make a sweet, no-bake recipe that’s portable, poppable and delicious. Pound cake is cut into chunks and then dipped in sweet dark chocolate for an easy and decadent treat. 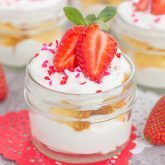 With just two ingredients and hardly any prep time, you can have this simple dessert ready for any occasion! Or, rather, a ‘re-confession’ as I’ve shared this before! I’m not the biggest fan of cake. Especially the store-bought or bakery kind. Yep, you read that right, even from a bakery! It just tastes ‘boxed’ to me, like it came from a box mix. And don’t even get me started on the frosting! That’s probably the main reason why I don’t like cake….too much frosting, and too sweet! I know, I know, I’m sure you’re shaking your head at me and calling me crazy. And that’s ok! Because I do like some cakes, minus the loads of frosting. Like this Blueberry Yogurt Cake (you all must love it, too, because it has great reviews), that Blackberry Crumb Coffee Cake, and this No-Bake Peanut Butter Cup Cheesecake (another favorite of yours!). Do you notice a trend here? No frosting, friends! 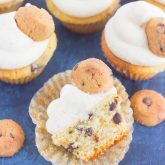 Now, I don’t mind lighter, non-buttercream frostings, like on these Mini Chocolate Chip Cupcakes or those Chocolate Cupcakes with Peanut Butter Frosting. But, hand be a slice of cake piled high with that sugary stuff and you’ll most likely find it scraped to the side. You frosting lovers probably think I’m nutty, but for those of you who don’t like frosting, I’m hoping you share my feelings. We can still be friends, right? I’m not sure you can even call this a recipe, as it’s just two ingredients: store-bought pound cake and melted dark chocolate wafers. And sprinkles, if you want to get all fancy. But even though this isn’t necessarily a homemade treat, it is definitely one that you want to keep around all year long! Pound cake and chocolate…how could you go wrong? 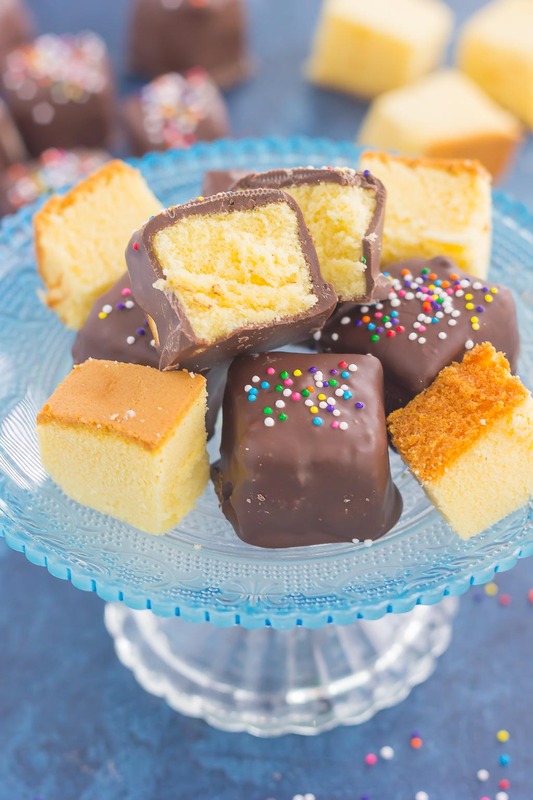 These Chocolate Covered Pound Cake Bites are perfect for so many reasons! If you’re in need of a dessert in a hurry, whip up these babies! Want a little sweet treat without all of the prep work? Pull out that pound cake and melt that chocolate! Looking for a bite (or three) of something chocolatey without undoing your diet or healthier eating? These are great for portion control! The fluffy, light pound cake texture pairs perfectly with the sweet dark chocolate. It really is a match made in food heaven! 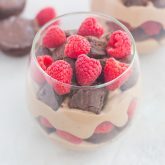 And, of course, these are one of the easiest desserts to make that I’ve shared with you. The hardest part (if you can call it hard) it cutting the pound cake into cubes and dipping into chocolate. And I won’t tell if you sneak a bite (or three) before the chocolate is hardened! Use a frozen pound cake if you can. This makes it easier to dip into the melted chocolate without the cake crumbling. I used Sara Lee All Butter Pound Cake (my favorite frozen kind!). If you want to use a homemade pound cake or a non-frozen one, place into the freezer to freeze almost completely so that it’s easier to dip into the chocolate without making a crumbly mess. Ghirardelli dark chocolate melting wafers are a favorite of mine for when it calls for melted chocolate. It melts a lot easier, smoother, and faster than chocolate chips. 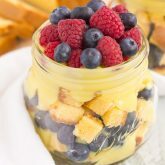 So if pound cake and chocolate are your thing, and heavy frostings and and that boxed taste aren’t, then you’ll love this simply decadent dessert! It’s perfect to have on hand for just about any time! Looking for more easy cake recipes? I’ve got you covered! 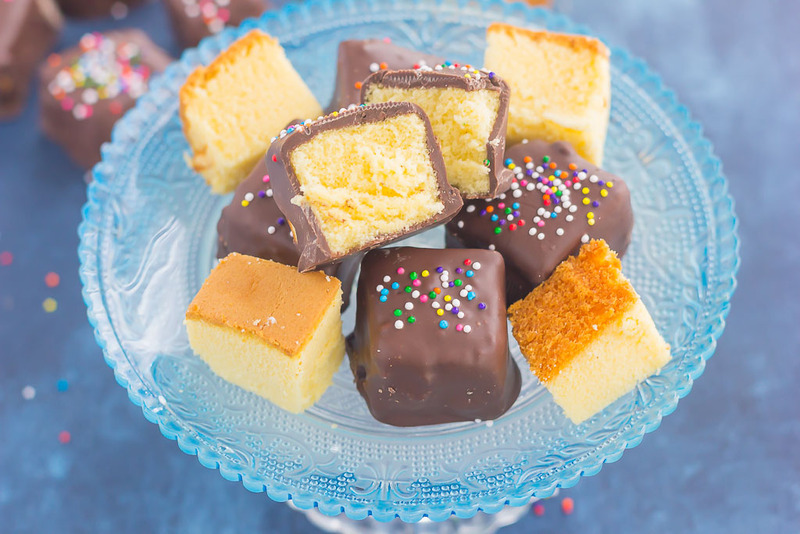 These Chocolate Covered Pound Cake Bites make a sweet, no-bake recipe that's portable, poppable and delicious. Pound cake is cut into chunks and then dipped in sweet dark chocolate for an easy and decadent treat. With just two ingredients and hardly any prep time, you can have this simple dessert ready for any occasion! Remove pound cake from freezer and allow to thaw just slightly (about 5-10 minutes). This will make cutting the cake easier. However, you want it to remain mostly frozen so that the cake does not crumble when dipped into the melted chocolate. Line a large baking pan (or a flat surface) with parchment paper. Cut pound into quarters the long way, then cut into about 8-10 slices. From there, cut into cubes. Set aside. 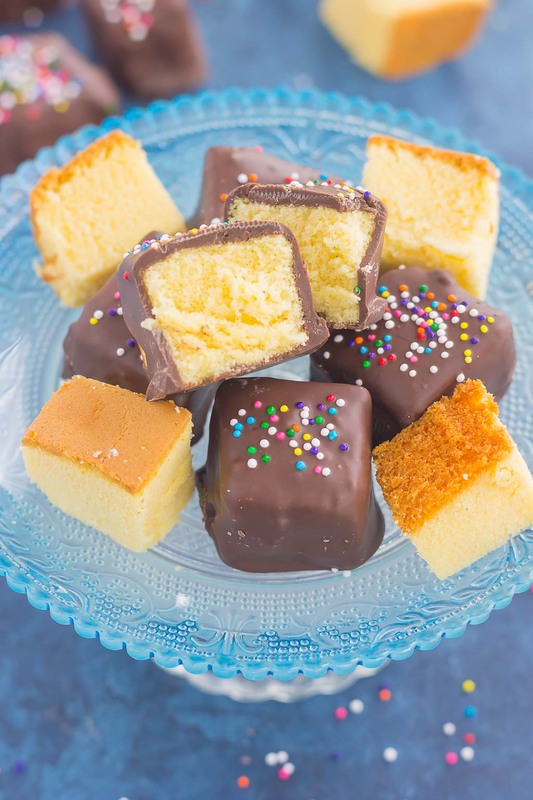 Working one at a time, dip each pound cake cube into melted chocolate, ensuring all sides are covered. Place onto parchment paper. Top with sprinkles. Repeat until all cubes are coated with chocolate. Place the pan into the fridge to harden chocolate for faster results. You could also just keep on the counter, if desired. I used a frozen pound cake because it will be easier to dip into the melted chocolate without having the cake crumble. If you would like to use a non-frozen cake, place it into the freezer to firm until mostly frozen so it is easier to dip into chocolate. Wow this is definitely something I haven't tried nor seen before. But I'm sure I would love them! 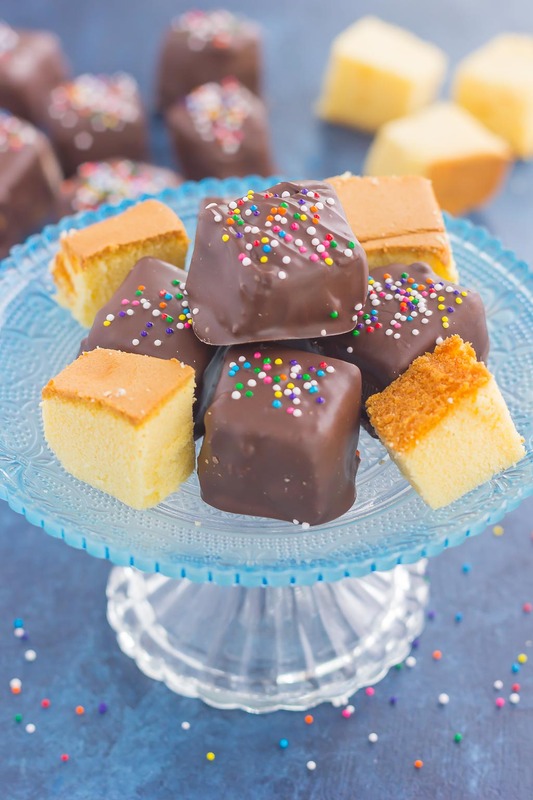 Every time I have cake, my favorite part is the chocolate over it.. Now This mini cake bites would be perfect!